On November 8, the New York Times ran a piece in the Food Section that turned the homemade bread world on it’s ear. Jim Lahey of Sullivan Street Bakery made public his recipe and technique for making the ultimate minimalist bread, one that requires no kneading and only four ingredients. Lahey claims that a six-year-old can make this bread. Food blogs buzzed last week with discussion, reports of success, and some gorgeous photos. I was a bit late in joining in the discussion due to an equipment dilemma, but I did spend some time over the weekend experimenting with the method, and I am very excited about the results. The crust is crispy, so crispy that it actually crackles audibly as it cools. I could hear it across the room. The interior is chewy and full of holes, like a good artisan-style loaf should be. The flavor is rich, and Michael asked me a couple times if the bread had butter in it, which it does not. Now, regarding my equipment dilemma. Lahey recommends a 6 to 8 quart heavy covered pot such as cast iron, enamel, Pyrex, or ceramic, and I have nothing that fits the bill. After scouring my cabinets and the attic for a couple days, I decided to try a half recipe in a regular loaf pan, but there was still the issue about covering it. My glass loaf pan has a plastic lid, certainly not appropriate for oven use. So I decided to put the dough into the glass loaf pan and then invert a metal loaf pan on top and use it as the cover, and I was pleasantly surprised. It wasn’t the lovely artisan-style boule that you will get with a round pot, but the bread baked up nicely. As soon as the first loaf was out of the oven I started the second loaf, a full recipe this time. I used the same baking method as before and still had good results, although there wasn’t much room available for expansion in my regular loaf pan. I think I’m going to scout out a good oval shaped dutch oven and try that. Lindy over at Toast says that it worked very well for her. The only part of the instructions that I disagreed with was the use of towels (flat weave) for the second rise. No matter how much flour I used, the dough stuck to the towel. I lifted the towel and turned it upside down, and the dough hung on like a barnacle. So for the next loaf I just put the dough into a shallow pan dusted with course cornmeal for the second rise, and it released perfectly. The original article, recipe, and instructional video are available for a very limited time at the NY Times web site, so check them out before they disappear behind the archives. 1. In the large bowl stir together the flour, yeast, and salt. Add water and stir until blended. The dough won’t look very pretty; it will be shaggy and sticky. Cover the bowl with plastic wrap and let the dough rest for 12 to 18 hours at warm room temperature, about 70 degrees. You don’t want the dough to get too warm since this is supposed to be a long, slow rise. 2. 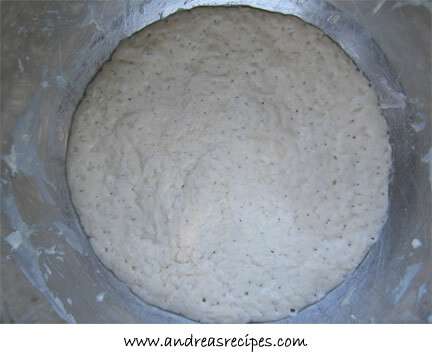 Check the surface of the dough; it should be dotted with bubbles. Lightly flour your work surface and turn the dough out on it. 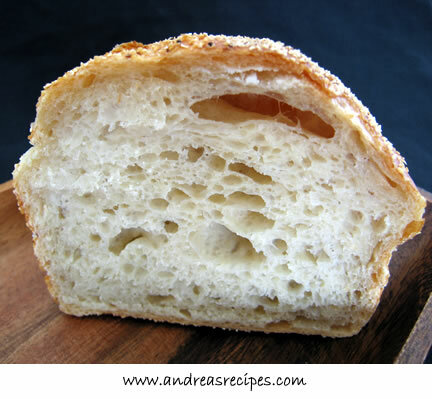 Sprinkle a little more flour on the top of the dough and fold it over on itself once or twice. Cover it loosely with plastic wrap and let it rest about 15 minutes. 3. Lightly flour your hands. Gently and quickly shape the dough into a ball. Dust the shallow pan with flour, cornmeal, or wheat bran, and then lay the dough in the pan. Cover with plastic wrap and allow it to sit for 2 hours. 4. About 30 minutes before the dough is ready, preheat your oven to 450 or 500° F (the higher the temperature, the better for baking). Put the heavy covered pot in the oven as it heats. When dough is ready, carefully remove pot from oven. Turn the dough over into pot, seam side up. It doesn’t have to look pretty, so don’t worry about the seam showing. Cover with the lid and bake for 30 minutes, then remove the lid and bake another 15 to 30 minutes, until loaf is browned and sounds hollow when tapped. Remove from the oven and cool completely on a rack. The bread doesn’t cut well while warm, so resist the urge to dive into it. The cast iron dutch ovens sold for camping work nicely with this recipe, and can often be found at garage sales for just a few dollars. Just be careful moving the lid around when it has been soaking at 500 deg.F. My late father, George, made bread for us in the l940’s and ’50’s: wholesome but, due to excess flour, a bit crumbly. Later, using Julia Child’s famous recipe, I began experimenting while grad student at IU Bloomington. Eventually, I even exchanged two letters with her, Child noting that her French bread recipe was one of her top achievements. Now, thanks to Mr. Lahey and Ms. Meyers, I can claim here that the “NO-KNEAD” plump loaf patiently finished last night was a total success — lots of holes, fine crust, grand flavor in classic crumb. Try it. Bon appetit! sPh: I’ve got a round 5 quart dutch oven that belonged to my late grandmother, and I think I’m going to give it a go. It’s not as big as what Lahey calls for, but it’s worth a shot. Dr. Rodgers: Thanks for letting us know how your bread turned out! 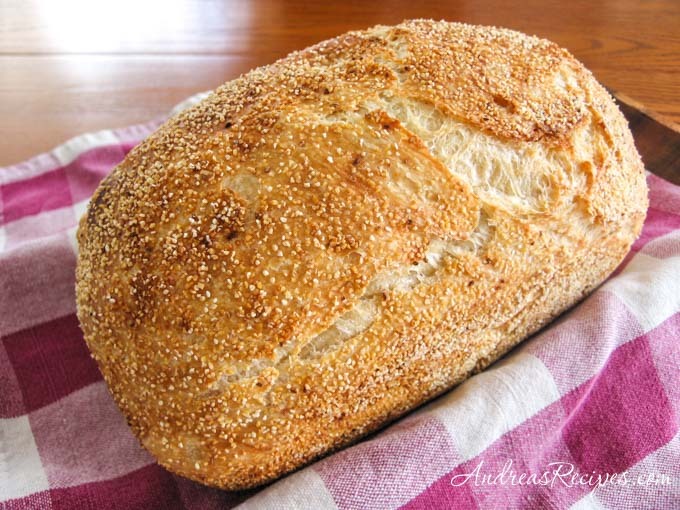 Sounds like you’ve had quite a bit of experience with homemade breads. Thanks for the loaf pan tip. I use a 2 1/2 quart Corningware casserole for no-knead bread; it works fine. In my oven I get the best results by placing the casserole quite high in the oven and lowering the temperature to 400 F as soon as I put the bread into the oven. Kathy, I also have a very old cast iron dutch oven from my grandmother! I agree that even though it’s very well seasoned, a little oiling would be in order, particularly since this is a wet, sticky dough. I love the no knead recipe! I have to make it again soon. Yours looks lovely!